My daughter has blue hair. It's true, you see. Recently the Intrepid Junior Blogger dyed her hair a rather astonishing shade of turquoise, after months of thought and discussion. The discussion wasn't about whether or not she could dye her hair, but rather about what colour she would most like to dye it. And, this past week, she decided on a shade that is decidedly unusual, and not normally seen in nature aside from peacocks. And it looks great. I was a teen in the 1980's, and in that time my hair was every colour of the rainbow. I recall a family friend, seeing me for the first time with coloured hair, commenting that I looked like an exotic bird. I also recall the many comments I got about my hair colour choices, many of them negative, and often coming from adults. I recall how my parents, farming folks by history, struggled a bit with it, and then got over it, realizing the coloured hair hadn't changed a single thing about me. I rather thought that in the intervening years the practice of unusual hair colours had become rather commonplace, and certainly less prone to provoke comments - but I may have miscalculated. I took the IJB and her cousin to the mall this week. I noticed the occasional stares, but it was the comments of two women, likely close in age to me, that caught my attention. Behind us in the mall concourse they said, loudly enough so I would be sure to hear it, that they "could not believe her mother would allow her to dye her hair THAT colour." I didn't allow my daughter to colour her hair blue. I encouraged it. I took her to my hair stylist to get it bleached in preparation. I bought the blue dye. I was there when she and her cousin did it - and when it fades and the time comes to dye it again? I will do it for her myself, any shade she wants. Why? Because I don't own my kid. Yes, you heard right. My kid is an independent creature with her own thoughts and ideas, and her own way of doing things. We agree on most things, and part ways on others. At almost fourteen I respect her autonomy in certain things - including the choice to colour her hair. In fact when she was in Grade Three and wanted permanent pink streaks dyed into her hair? I made sure she got them, because it is hair, and it is hers, and it makes her happy, and who the hell am I to tell her she can't do it? In the world of "pick your battles carefully" this isn't even a tiny dust-up. Last night we went to an event and I was beyond pleased that the IJB was surrounded by adults who told her how much they love her hair. They are the kind of adults I want in her life, the ones who see past blue hair (and crazy clothes, and, if some day she chooses, tattoos and anything else) and see her for who she is, blue hair and all. These are the adults who are the role models I want her to embrace, and who she will remember. So, if you see a kid with blue hair around town (and wearing heels) then it is likely mine. 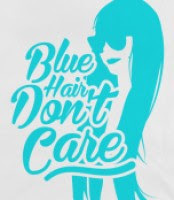 And if you don't like her blue hair maybe you should think about why it matters to you, and why you think others should live to your standards of behaviour. Recently I had an encounter on this blog with a commenter who chose to remain anonymous (no surprise there, the cowardly ones who like to leave nasty hurtful words always do) and who tried to "shame" me into conforming to the behaviour standard to which they subscribe - but who are they to tell me what is the proper way to behave, exactly? Who are they to dictate how I should spend my time, run my life, or colour my hair? Do they have to live my life? The answer, of course, is no, and I spent some time discussing this with the IJB. It would seem she has learned this lesson well over the years - as the IJB now has blue hair. And for the record we don't care what you think of it, either. I always wanted to dye my hair as a teenager, but my mom wouldn't let me ;) I don't know why anyone cares though. It's just hair and it will grow back! Let kids be kids/teens be teens. Like you my mom wasn't even phased when I dyed my hair all colours of the rainbow, she figured, hey she goes to school, gets good marks, participates in the community. What she knew was that there were far more scary things out there for a teenager to get sucked into, hair who cares, there wernt needle tracks, teenage pregnancy or a host of other horrors. Hair can be dyed back when the need comes or cut off (oh did that too)! Feel for you. Oldest wanted her's dyed too. We did it in Canada and the comments when we got back.... What is the weirdest is that most Australia's in this town want to send their kids to boarding schools so that they can have their kids exposed to different people and ideas, beliefs. But yet in their own town they can't except any of those differences and ideas. They make fun of and are quite hurtful. The hairstylists are safe and I even got mad at them. Oldest came to them with a photo of a quite dramatic hair cut and they made it safe. She wasn't happy and I stepped in (of course by then too late) but I said why did you make this a safe cut?, what about this picture or this kid with green hair makes you think she wants a safe cut? Hairstylist was mad and we left in tears telling them we would never be back. Lots of hippocrates out there. Some people have unusual hang ups over the silliest things. Really I don't get it. It's only hair and its not like its hurting anyone. I once worked with a guy with a ginormous mohawk (and a ton of piercings in his ears to go along with it) but he was one of the nicest and hardest working guys I've ever known. I've lost track of the number of hair colours my daughter's gone through but, you're right, it's just hair. If blue/orange/red/purple/black/yellow hair is the worst I have to deal with, I'll consider myself lucky. Her body, her choice, her life.